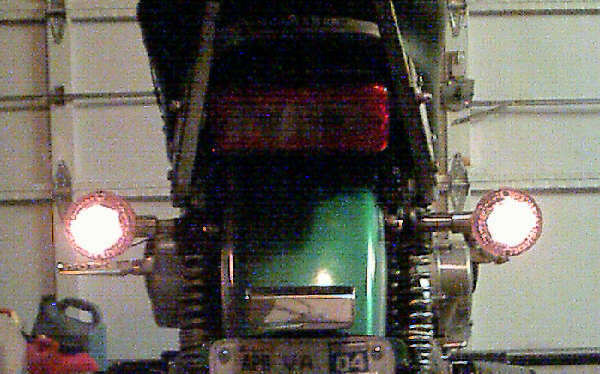 "Much less power drain, reliable, and visible"
Here's the LED turn signal modification tech tip for bikes with ROUND turn signals. These leds are acquired from SuperBright LED's web site . 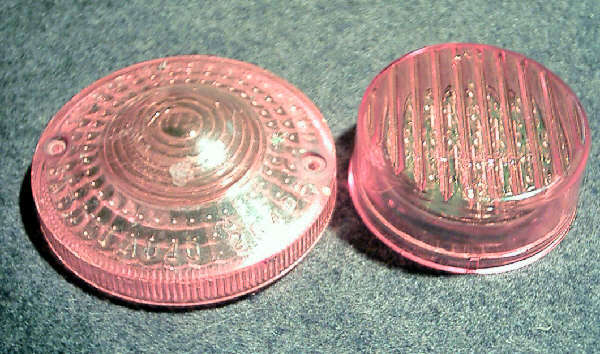 They are 2+1/2" diameter Amber Marker lights, 13pcs LED model# 1279A at $6.95 each, without pigtails or rubber grommets. The site also carries a 2" diam. which "might" fit into the light socket without as much cutting at $5.95ea, but it only had 9pcs LED bulbs in it...I wanted as many as I could fit into the socket for as much brightness as possible, since these were only designed as marker lights, not actual turn signal lights. The bulbs,resistors, circuit board and wires were all encased in a thick epoxy layer, so I couldn't try to experiment with it by bypassing some of the resistors to see if they could be made brighter! **They sell a small rectangular 3.8" x 1.2" 12pcs LED marker light in both amber and red for $6.95ea. that could be cut down to fit inside the rectangular shaped sockets of standards, but the plugs in the back are male vs. female, so a different connector would need to be used. 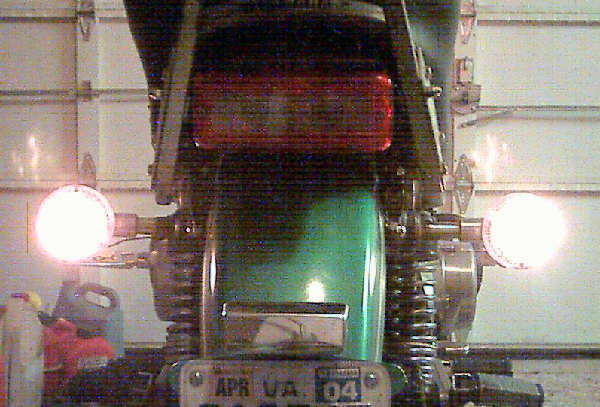 I actually ordered a couple to replace my frame side marker reflectors just in front of the gas tank!! As mentioned, you don't need to order their pigtails or rubber grommets, but you will need a supply of bullet type wire connectors and wire to plug into the sockets in the back. Also highly recommend a Hot Glue Gun, along with soldering iron and electrical tape! You will also need to purchase an "Electronic" flasher vs. a "thermal" one due to the extremely low load these lights put on the circuit. Neither the OEM Yamaha flasher or a thermal one will work! YOU WILL LOOSE your self cancelling feature! But these only draw 0.03amps each vs. the 2.25amps each for your 27watt turn signal bulbs!! 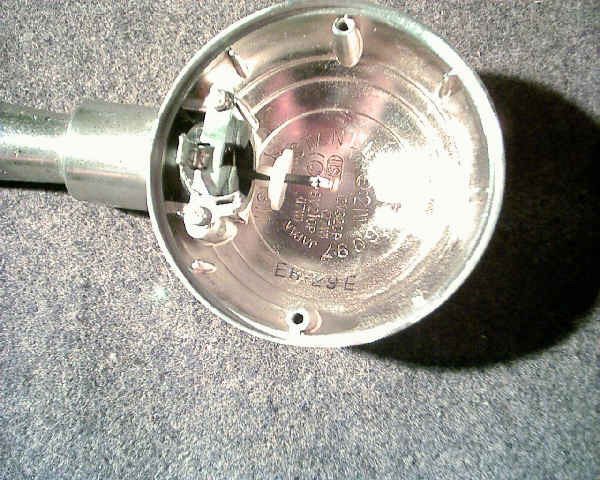 This technique preserves the OEM socket so that "IF" you ever wanted to go back to the OEM bulbs you could, but with 100,000 life hours for these...who really wants to. I will admit that these do not appear quite as bright as the OEM 1156 bulbs but they are close, and are a definite power savings, and you don't really have to worry about them burning out!! Let's get started. First, take the LED lights, and cut off the front cover using your Dremmel thick cut off disc cutting just above the base. 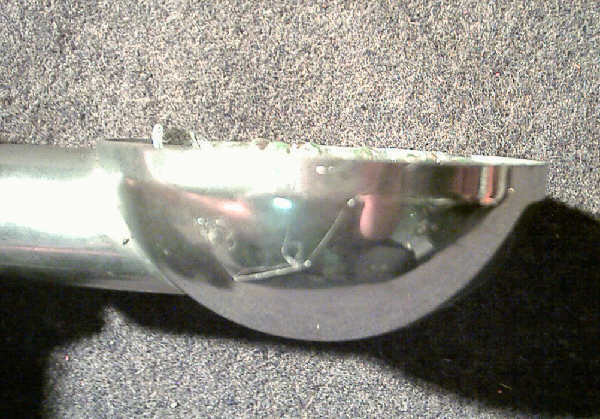 Then cut off the thick outer lower rim from around the base, so that you're left with the LEDs and circuit board. Next, pull all of your turn signals off of the bike. Remove the Amber lens covers, and then the bulbs. Clean out the inside of the reflector housing with a rag and alcohol/acetone to remove any possible dust/grease to allow the hot glue to adhere! 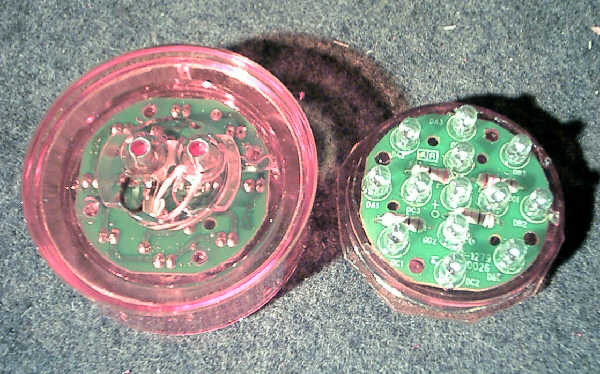 Next, push up on the center positive wire at the mounting, you may need to grab it inside the rubber socket to pull it up far enough to gain access to it, and slide the plastic socket base down from the tip of the metal contact post attached to the end of the wire. Cut 4 pieces of 4" long wire, preferably color coded for both positive and negative terminals, you will have 8 pieces total. Strip both ends, one only enough to fit inside the bullet connector for crimping, the other end about 1/2". Attach them to the bullet connectors, and then bend the tips of the connectors so that they make a 90 degree angle, be careful, the connectors can split/crack/break. 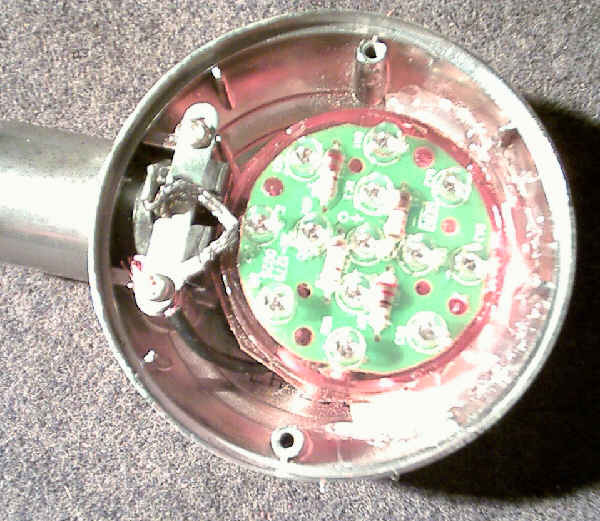 Then attach the positive wire around the base of the socket wire metal conact tip. I then soldered the wire to the metal tip....you can always melt the solder to remove the wire for reverting back to OEM. Then wrap some electrical tape around this junction. I also soldered the wires to the bullet connectors to avoid corrosion factor. 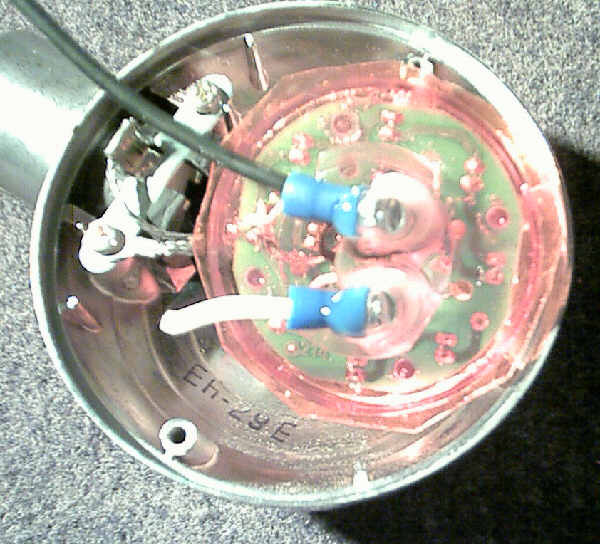 Then plug them into the LED sockets, and again I used a little solder on the bullet to LED connectors. 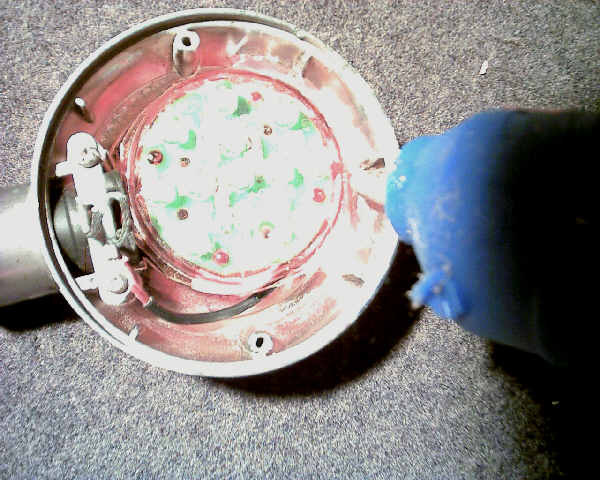 Then use the hot glue gun and put a big glob of it all over the socket/wire connectors to insulate them against making contact/grounding to the back of the turn signal socket. 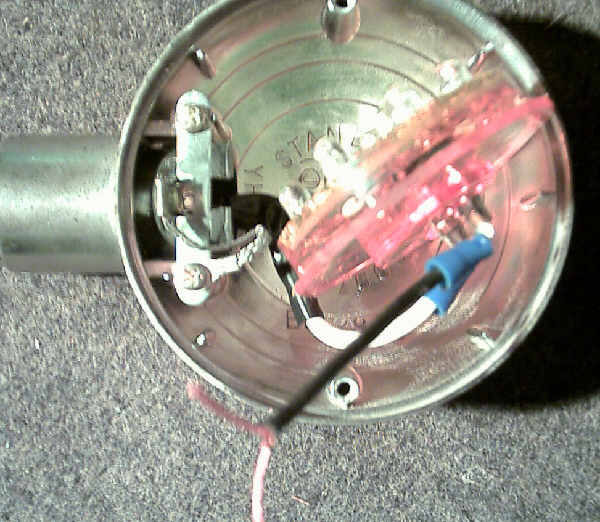 Next, pull/push the center wire back down towards the socket base, bend the wires to allow placement of the LED bulb into the reflector base, so that ground wire can come out and make contact with the screw terminals and grounding strap of the socket. I split the loose end of the ground wire, twisted each end, then bent them and placed them under the grounding bar and around the base of the screw, then just replaced the screw and tighten to secure the ground wire. 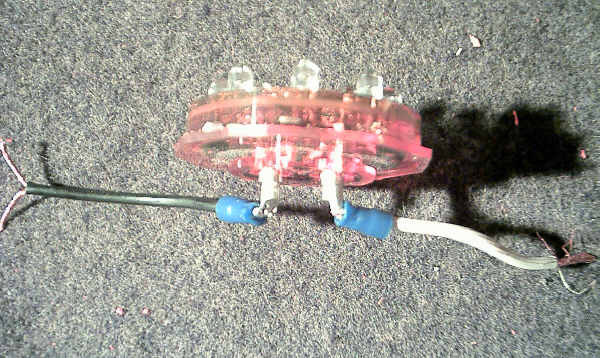 Push the LED base down against the reflector, there are several ridges inside the reflector, I was able to wedge the base of the LED down against the first ridge, and then applied liberal amounts of hot glue all around the LED base almost 180 degrees worth holding it in place if necessary until the glue cools and sets...just a few minutes. Notice how nice and flush the LEDs are sitting inside the reflector housing...the further they are from the front edge of the lens cover, the better the lens cover and it's diffusor surfaces can spread the light wider to make it appear more visible. This next image is a little more realistic of what you see with your human eye when they flash, not as overly bright as the earlier picture due to overloading the camera sensor/pickup!